Which EPO Online Services do I need a smart card for? Why does the EPO use smart cards and how secure are they? Can I use my smart card on a laptop as well? I have to use a non-EPO smart card to log on to my company network. Can I use my EPO smart card on the same PC? How much does the smart card/reader/software package cost? Is the EPO using new smart cards? I have received a new smart card, and I notice that the name of my company is no longer on it. Is this correct? Our company would like to order several smart cards. Can we enrol for them in a batch? Can you issue a collective smart card in the name of my company? Can I have more than one smart card? How can I obtain a smart card? What are the various stages involved in the smart card application procedure? Can I use a non-EPO smart card to access the EPO’s secure online services? How long will I have to wait for my smart card? If I countersign an enrolment form for my secretary (I am an authorised representative), will she be entitled to sign applications with her smart card? How long are EPO smart cards valid for? My smart card is going to expire soon. How can I renew it? When I tried to renew my smart card I received the message "Your smart card has not been recognised as issued by the EPO". What should I do? My smart card has expired. How can I get a new one? If I get a replacement or renewal smart card, will my PIN code stay the same? What do I need to do in order to revoke a smart card? What should I do with my revoked/expired smart card? I have tried – but failed – to activate my new smart card via the link on EPO website. What should I do? I have still not received my PIN code. What should I do? I have lost/forgotten my PIN code and can no longer use my smart card. What should I do? How can I check that my PIN code is correct and not blocked? I have entered an incorrect PIN code and my smart card is now blocked. What should I do? What is the difference between digital (smart card), alphabetical and facsimile signatures? I am an administrative assistant to a professional representative before the EPO but I am not a representative myself. Can I use Online Filing? My name is on the EPO list of authorised representatives but I am not an EPO professional representative. Can I use Online Filing? What do I need to do to access the EPO's Online Fee Payment service? Can I pay fees or view the balance of my EPO deposit account without a smart card? I am trying to access and view our EPO deposit account but do not appear to have the necessary options when I log into the portal. What should I do? I’ve received and registered my smart card. How do I view the balance of my EPO deposit account? I seem to have accidentally removed the certificates from my smart card. What should I do? I am about to get a new PC and would like to use my smart card on it. Do I need to export my certificates from my current Web browser? Can I sign e-mails with my EPO smart card? Can I use any other smart card readers apart from the one supplied by the EPO? Where can I get another smart card reader? 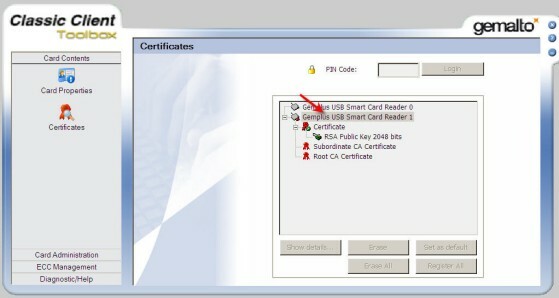 Are there any system requirements for smart card reader installation? Is there an online tool or guide which will explain to me, step by step, how to install and use my smart card? How can I be sure that my smart card software is installed and functioning correctly and that my smart card is recognised by the system? I have connected my smart card reader to my computer. How do I turn the power on? Is there any way of checking whether my smart card reader has been correctly installed? I am in the Classic Client Toolbox (Libraries 6.3) and I cannot see my smart card reader or certificates. What does this mean? What is the latest version of Gemalto? Where can I obtain the Gemalto software? Which Gemalto version supports Windows Vista? We have a network Online Filing installation. Do we need to install Gemalto Classic Client version 6.3 on all clients? Could you provide me with the link to the latest version of Gemalto Classic Client? I use the Mozilla Firefox Web browser. How can I set it up to recognise my smart card? I have Gemalto 6.3 installed. I am no longer able to log in to My.epoline. Instead I get the message "Page cannot be displayed in Internet Explorer under Windows Vista, Windows 7 and above" What should I do? I am leaving my company today. Do I need to have my EPO smart card revoked? I cannot see a user in the “Users” tab of the company portal. What should I do? I’m the company administrator, and on the list of users I can still see the names of several users who have left our company. How can I remove them? I’m changing company. What do I do with my active smart card? I’m leaving my company but I do not have a new employer. What do I do with my active smart card? Smart cards are credit card-sized plastic cards that contain a microprocessor and a small amount of memory. The EPO decided very early on in the planning process for its online services that the certificates which would allow users to conduct secure transactions with us would be stored on smart cards. Unlike passwords, smart cards allow us to provide the more secure two-factor authentication, comprising something that is held (the card) and something that is known (the PIN.) Two-factor authentication means that PINs can be simpler and therefore easier to remember than with a password, since, without the card, the PIN is useless, and vice versa. Also, the simpler PINs are not susceptible to brute-force attacks because the smart card locks out after several unsuccessful attempts to enter the PIN. In addition to being small and portable, smart cards afford a much higher level of secure storage for certificates than, say, if they are stored on a hard drive. They offer tamper-proof storage of the user's private keys and digital certificates, are highly resistant to unauthorised deletion or copying of the certificates and keys, and any attempt to tamper with them requires significant effort which would invariably result in physical damage to the cards themselves. Also, it is easier to spot the loss or theft of a card than of a certificate stored on a computer. Yes, you can use it either with the EPO-supplied smart card reader, or with an internal smart card reader, supported by the Gemalto software. Yes, you can use your EPO smart card as well, provided that you have installed the Gemalto software. You cannot, however, use your EPO smart card to access your company network. Smart card packages are supplied free of charge. Yes. Smart cards are now valid for five years, and they are issued to the individual; this means you can take yours with you if you change employer or use it for several companies at a time. Yes. In 2013 the EPO opted for a new generation of smart cards. You are now issued a smart card as an individual rather than as an employee of a specific company. This allows you to use your smart card for several companies at a time and to take it with you when you change employer. No, this is not possible. Each person has to enrol individually (there is a secret security question for each card holder). No. We can only issue EPO smart cards to individual natural persons. No. The EPO can only issue one smart card per person and legal entity. You can enrol for an EPO smart card online. Please refer to the information on smart cards in the Security section. Some non-EPO smart cards can be registered online. Once we are in receipt of the signed and scanned copy of your enrolment form, your request will be processed and your new card will be delivered via the DHL courier service. You will receive a confirmation e-mail quoting the DHL tracking number once your card has been dispatched. If you do not receive your smart card within 21 days, please contact us. If we do not receive a signed and scanned copy of your enrolment form within two months of your online enrolment request, your smart card request will be automatically rejected. If you still require a card you will have to start the enrolment procedure again. Please send your signed and scanned copy of your enrolment to support@epo.org. No, only authorised persons (representatives, authorised legal practitioners and employers) are allowed to use their smart card to sign applications. EPO smart cards are now valid for five years. The validity date is indicated on the smart card. The expiry date of your smart card is printed on the card next to your name. You can renew your card online up to 60 days prior to the expiry date. Your new smart card will be sent to your current address via the DHL courier service. Thereafter, a new PIN code will be dispatched via standard post. If the expiry date has already passed, please contact us. No, each new smart card is allocated a new PIN code. Smart card holder, or the company Administrator is obliged to request the revocation of a smart card. Please contact us. If your smart card has already expired or if you have already asked EPO User Support to revoke it, you should cut the smart card across the metallic chip and dispose of it. 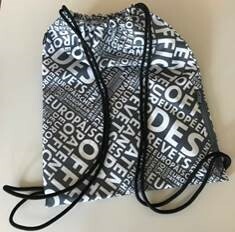 You do not need to return it to the EPO. 1) First check that you have the right software for new generation smart cards. You need to have Gemalto Classic Client 6.3 (password-protected) correctly installed for new generation smart cards to work as they should. If you have already installed the software, start by uninstalling it (it may not have downloaded properly the first time). Please restart your computer after the installation. 2) Then check your smart card. Ensure that your card is correctly inserted in the reader. 3) Check that your web browser is correctly configured. If you are using Internet Explorer 7.0 or later versions, please go to Tools, open Internet Options and check the following. (a) The Enable Protected Mode option should be unchecked. Alternatively add www.epo.org/ and https://my2.epoline.org/portal/ to the Trusted Sites. (b) Users of Microsoft Internet Explorer 7.0 and 8.0 will need to uncheck Enable Protected Mode and enable SSL 2.0 to allow secure access to online services. Users of Microsoft Internet Explorer 9.0 and 10.0 will need to uncheck Enable Protected Mode and disable SSL 2.0, TLS 1.1 and TLS 1.2. If you are using Mozilla Firefox, please follow the procedure described here. You should now be able to activate your smart card on our website. When an individual requests a smart card, a portal is created at the EPO end. This portal is created from the information that the individual provides in the “Company details” field on the registration form. If you have not received you PIN code, please contact us for assistance. Go to Start - Programs - Gemalto - Classic Client - Classic Client Toolbox - Card Administration - PIN Management - Change PIN - Next. First make sure that your smart card is correctly inserted in the reader. Then run the Gemalto Toolbox by clicking on Start - Programs - Gemalto - Classic Client - Classic Client Toolbox. Click on "Certificates" under "Card Contents" and enter your PIN code to log in. If your PIN code is wrong or blocked, an error message will appear. You should contact us informing us of your smart card details and ask for your Admin PIN. You will be required to answer the security question which you initially provided when applying for a smart card. Each smart card contains a personal electronic key, which is equivalent to a "live" signature in the paper world. Only authorised representatives, i.e. professional representatives before the EPO and authorised employees whose names are entered in the official list maintained by the EPO, are entitled to use a smart card to sign their submissions. An alphabetical or text string signature is a string of alphabetical characters, preceded and followed by a forward slash [/], selected by an individual person to provide evidence of their identity and their intent to sign the document in question. The name of an authorised representative without the forward slashes cannot be used to replace such a signature. A facsimile signature is a scanned image of a handwritten signature. The image file (in TIFF or JPEG format) is attached to the application. Yes. You can draft applications in File Manager and send them. However, any documents filed online must be signed by a person authorised to act in the proceedings in question. Yes. You can draft, sign and send filings. You can use all three modes of signing: digital (via smart card), alphabetical or facsimile. You need a deposit account with the EPO, a smart card and smart card reader and an internet browser. Additionally, your company administrator must grant you access to the company portal. No, you need a smart card to be able to do this. First you should contact your company administrator and check if you have the rights to access the service, then you need to contact the EPO to check if your deposit account is correctly linked to your smart card. As company administrator, you can give yourself access rights to the service. Your smart card will have to be replaced. Contact us for assistance. Your certificates are stored on your smart card and are automatically registered in the new Web browser on your new PC. If you want to set up Mozilla Firefox to recognise Gemalto so that it can read your smart card, you will have to manually register your certificates. No. The certificates in your smart card are meant for use with the EPO's Online Filing and secure online services only. We recommend that you use the readers we supply, as they have been tested and approved. However, you can also use any other reader that is recognised by the Gemalto software. We cannot, however, offer support for readers not supplied by us. If your reader is faulty or if you did not receive one with your smart card, you can request one from us. No, but you have to install the complete Gemalto software (smart card reader driver and the appropriate Classic Client) on your computer. Look at the icon in the Windows system tray on the right-hand side of the task bar. indicates that your smart card reader is functioning correctly, but that it does not contain a card. or indicates that your smart card is recognized by the reader/software. Try changing the connecting lead to another USB port. If that does not work, try it on a different computer. If your reader works on another machine, you should consult your computer dealer/IT department. If not, please contact us. If the green light on your smart card reader is flashing, that means your smart card reader is switched on. If the light is not flashing, plug the connecting lead into any functioning USB port on your computer. The green light should go from blinking to steady when you insert your card. If it does not, check that the end of the card with the chip element is inserted face-up in the direction of the arrow, and that the Gemalto software is installed. In Gemalto 6.3 go to Start - Programs - Gemalto - Classic Client - Classic Client Toolbox - Certificates. You will see the window below, with the reader icons shown. This means that Gemalto Classic Client 6.3 is unable to access the smart card driver and that you may need to install it. You will find the link to Gemalto Classic Client version 6.3 and the requisite driver in the cover letter accompanying your smart card, or you can request it from us. The current version of Gemalto is Classic Client 6.3. You will find the link to Gemalto Classic Client version 6.3 and the requisite driver in the cover letter accompanying your smart card, or you can contact us. Gemalto Classic Client 6.3 runs on Microsoft Windows 2000, XP, Vista (Home and Business) 32-64 bit. Gemalto Classic Client version 6.3 must be installed on every PC where a smart card reader is used. Version 6.3 of Gemalto Classic Client is now available. Please contact us for the link and the password. For instructions on please see our installation guide. make sure that the options "Enable Integrated Windows Authentication" and "Use SSL 2.0" are checked in the Advanced tab of Tools/Internet Options. No. At the beginning of 2013 the EPO opted for a new generation of smart cards. You are now issued a smart card as an individual rather than as an employee of a specific company. This allows you to use your smart card for several companies at a time and to take it with you when you change employer. You cannot remove them. Please contact us. The smart card holder or the company administrator must contact the EPO in order to request the necessary changes (name of new company, deposit account).